A Stroll Down Memory Lane | SoHo Memory Project. Every once in a while, I like to dip into our SoHo Stories folder to gather and share some of the wonderful memories of old SoHo readers have submitted to The SoHo Memory Project (to share your SoHo story, click on the "Share Your SoHo Stories" link above). It’s fun to see where there are overlaps or if there are themes that run through them. In this batch, a lot of people remember finding useful things on the street and while dumpster diving. And the loading docks, everyone remembers them. Quite a few also mention Fanelli’s and other SoHo gathering spots. I especially like the very funny story about the chickens! Amber, who was in SoHo from the 1970’s through the 1990’s, misses a lot about old SoHo: The stuff you would find in the dumpsters. My mother found a spool of gold and silver card stock, and I would make full-body head dresses out of it and wear them around the neighborhood and to pizza at that place with a garden on 6th ave that became a Duane Reade. the carrot cake at Food, that spicy pepper smell around Broome or Grand. The constant creative activity- the neighborhood was so sparsely populated, and it was just "us" and the guy at Zelf tool rental and the nice people at Fanelli's. The sound of the trucks, the Neon Gallery, and the broken kilometer, and of course the Duane Hansons. Richard (b. 1946) lived on Grand Street from 1975-1990: Sohozat, DeRoma's, Broome Street Bar, Magoos, The Cupping Room, The Performing Garage, The Canal Street Flea Market, O.K. Harris Art Gallery, Lucky Strike, Watts Happen Inn, Fanelli's, Vesuvio Bakery, The Spring Street Bar, Smokestacks Lightning, The Nancy Whiskey Pub, Leo Castelli Gallery, The Earth Room, The Ear Inn, cobblestone streets, blackouts and blizzards. Searching for wood on the streets in January of 1976 to bring home and burn in my pot-bellied stove. Being able to make art and then display it in the window of my studio. The Bells of the Church of Saint Alphonsus. Hornblower Antiques. Hanging out on the stoop of my studio and talking to the old long-time Italian immigrant neighbors. The sound of the Grand Street bus going East. The sunlight coming through the front windows of my studio. Lucien (b. 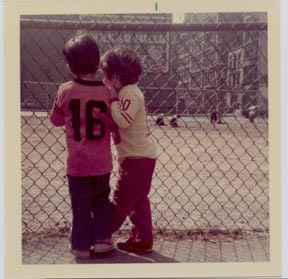 1966) grew up in SoHo: Playing at playground east of Silver Towers while my parents climbed the fence into the field at the NE corner to play softball. Judson Health Clinic. Mary's Candy store on Thompson. Dumpster diving! Running along Greene or Wooster along the tops of loading docks and other building structures playing "don't touch the ground" with my brother. Sword fighting with cardboard tubes left over from bolts of fabric. Climbing in and on the bread delivery trucks at Wooster? and Prince. Nicholas (b. 1967) was also a kid in old SoHo: My mother sent me to the bodega on West Broadway and Prince street to get her beer and cigarettes when I was 9. One of the guys who worked at the bodega sent me home to get a note from my mother. When I returned with the note he put the 6-pack in a paper bag and walked me half way home before handing me the bag. I think he was nervous about breaking the law. That kind of thing would be impossible today. Kaleb (b. 1968), who lived in SoHo from 1977-1991, remembers: I woke up one morning to the sound of chickens. I thought I was dreaming. I got up and looked out my window. A truck carrying cages of chickens heading to the slaughter house on Mulberry and Prince had taken the corner on Lafayette too fast and cages of chickens spilled across the street, many cracking open. Dozens of chickens were wandering around dazed, clucking, confused. Sybil (b. 1954) lived in SoHo from 1977-1999: During my first summer there, 1977, there was the big Blackout in the Northeast. I remember sitting on my fire escape around three in the morning and seeing more stars than I'd ever seen in NYC. Mike Fanelli, asking the local tradesmen/artists, "are you working", and not charging folks if they were out of work. Then, there was the guy who, around 10 or 11 at night, every so often, would come riding across Prince Street on a bicycle, from the Bowery, towards Soho, singing opera at the top of his lungs, with his dog running along side of him. I could hear him from blocks away, before he appeared outside my window. If I was in bed, I'd get up to run to the front room window, to see him. It made me feel joyful to hear and see him. Vered (b. 1947) has lived in SoHo for close to 50 years: Meeting talented people from all over the world and from places in the United States that I had never heard of. They came, every year, the best and the brightest from rural, agricultural and cosmopolitan places and they all ended up here trying to build old lofts into studios and to make themselves famous. Andy Warhol walked and hung out among us, Henry Miller too, Blondie sang at Arturos, Phillip Glass bought my piano when I needed rent money. Thornton (b. 1936) who has also been in SoHo for half a century remembers: The buildings, the architecture that is so compelling both inside and out. It was a soulful place filled with artist of diverse background, drawn here from every part of the US and abroad to try and make art of every kind; jazz, poetry, sculpture, dance, painting, and photography etc. The energy was amazing and unique because we were here in one area while the rest of the city for the most part ignored us. Thanks to all of you who submitted SoHo memories. Please keep adding to our collection (click on "Share Your Stories" above). Memory is ephemeral, so lets catch as many as we can before they slip away!